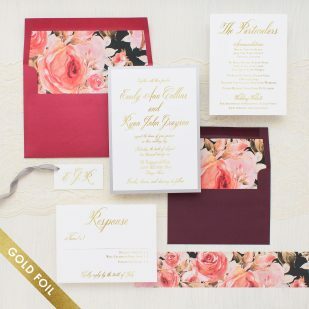 Gold foil printed Blush Petals wedding invitations with burgundy, crimson red and silver. Simple and elegant gold foil fonts on bright white paper creates a modern & timeless look. Our gold foil product photos show how the entire design would look if it was foil printed. You can choose to get the belly band tag & inserts (info card and or rsvp card) foil printed for an additional cost. Envelopes can not be foil printed. 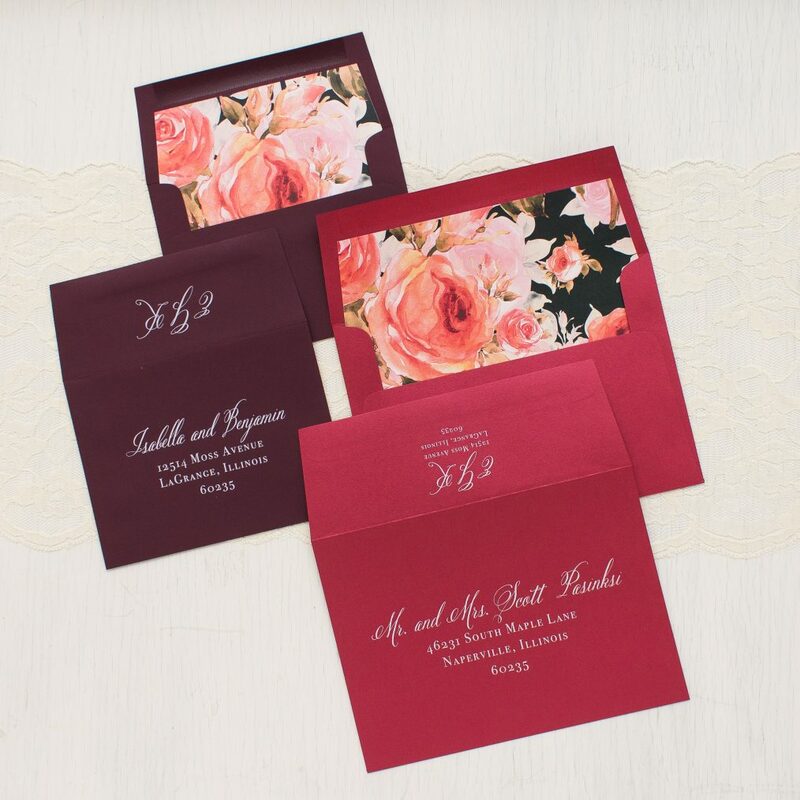 Add on a set of hand crafted envelope liners, a pattern belly band & digital guest addressing to complete the look. You can also customize the envelope liner & paper band pattern. Additional options HERE. Click on the place your order button below to enter your quantity & calculate your exact cost. We offer 8 different paper types suitable for foil printing. Order a gold foil sample packet to learn more. 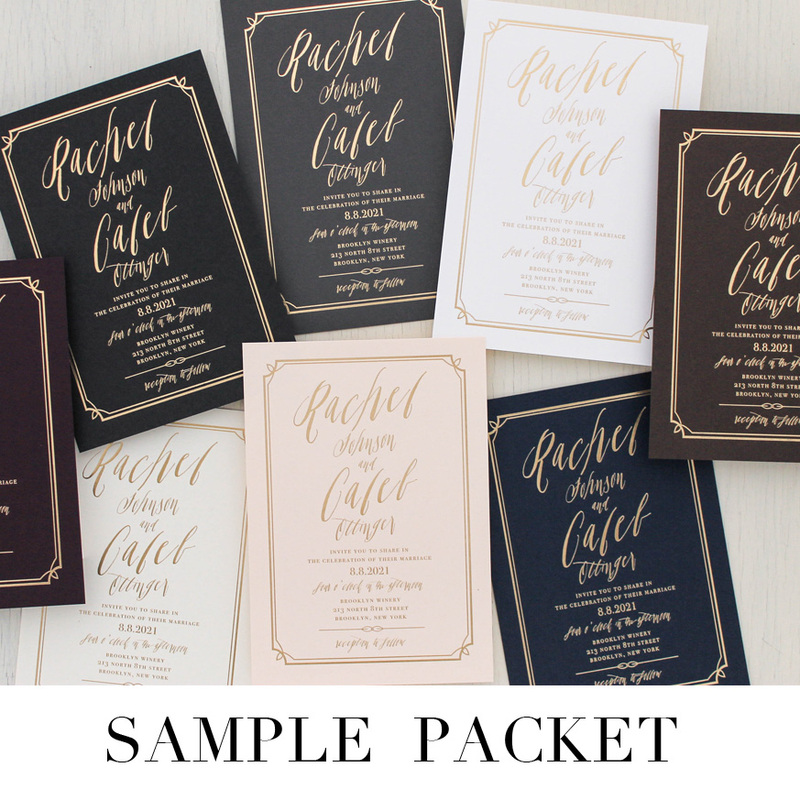 Our sample packets include: an example of our foil printing, our 8 foil ready paper types and a digitally printed bundled version (that will show how we assemble the invite). Inquire for more info. Welcome to our foil printing ordering page. Below you can choose your customizations, enter your quantity & calculate your exact cost. We recommend creating an account to save & edit your selections. If you would like to order this design with the exact materials that we’ve used in our sample photo, select same as sample below. Certain paper types are suitable for foil printing only, some are suitable for foil & digital printing, some suitable for digital printing only. A designer will review your order and provide recommendations and/or answer any questions that you may have during the proof process. Can be used for general wedding info, accommodations, directions, wedding website, and additional event details. Don't need that second insert? Remove for a $0.50 credit. Our product photos show how the entire design would look if it was foil printed. You can choose to get the belly band tag and inserts (info card and or rsvp card) foil printed for an additional cost. For quantities over 200, please inquire on pricing. Visit our envelope liner section for comprehensive list.